Hello, and welcome back to our blog! Now that the holiday season is officially here, most pet parents will include their fur babies in all of their holiday celebrations. As you get ready for the holidays, you’ll want to keep your pet’s health and wellbeing in mind. With all the holiday festivities, travels, visiting guests, and extravagant meals, it can be easy to lose track of your pet’s needs in the hustle and bustle of the holidays. Here are some holiday pet care tips for pet parents so that you can keep your furry companions safe and protected from a variety of holiday hazards. In our last blog post, we explored some of the foods that you should never feed your dog. With all of the festive holiday meals that will be cooked, there are staple holiday foods to avoid giving your pup. Turkey, Turkey Skin, and Bones: While baked, unseasoned poultry without the skin is a great fresh food alternative to feed your dog, holiday turkey is packed with seasonings, sodium, and other ingredients that can upset your pet’s tummy. While people often extend the giving tradition to their pet, it’s best to avoid giving them tastes of holiday turkey. The skin can affect their pancreas and turkey bones can split, causing damage to your dog’s digestive tract. Chocolate: If you’re like most, chocolate candies will fill small holiday bowls throughout your household, which increases the chance of your pup sneaking a taste of one (more likely several). Chocolate of any kind is an absolute no-no, as it is toxic to both dogs and cats. Baked Goods & Breads: Sweets of any kind (other than dog-friendly fruits as listed in a recent blog post) are off-limits. Most sweets contain xylitol, an artificial sweetener that is harmful to cats and dogs which is linked to liver failure and even death. Also, keep in mind that yeast dough used in baked goods is very harmful to pets and causes bloating that may result in extreme sickness and/or death. Candles & Other Smell Goods: Candles, potpourris, and oil diffusers make the holidays even more magical, but these items can be harmful to pets. Dogs and cats can easily knock over lit candles which could result in injury to them or worse, a house fire. Always keep candles in safe areas where pets can’t reach them. The same goes for scented oil and potpourri that may look and smell appealing to a curious pup. Potpourris feature fragrance, paints, and dyes that, if ingested, could make your pet very sick. Table Decorations: Pets, especially dogs, often mistake stuffed holiday decorations like silly Thanksgiving turkeys, fun pumpkins, and other traditional decorations, for puppy toys. These decorations tend to feature smaller adornments that could tear your pup’s intestinal tract, and may require pet surgery to remove the harmful object. Keep these decorations out of reach from your pets to be safe. Thank you for reading our blog series. 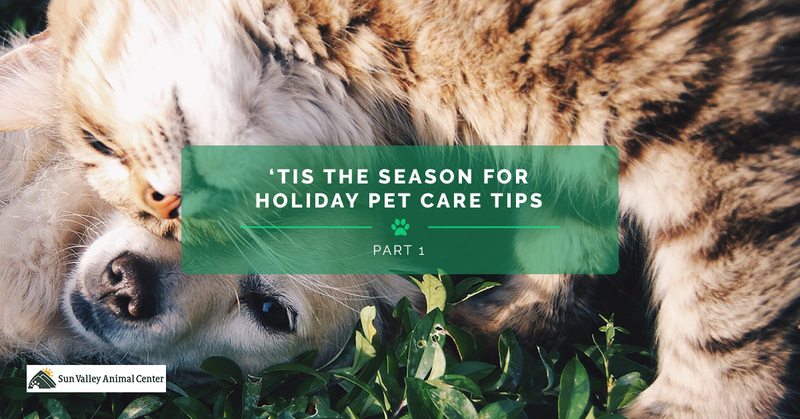 We will post more helpful tips in parts two and three so that you can maintain your pet’s health and safety throughout the holiday season. Should your pet ingest hazardous objects, toxic food, or need a pet surgery, give Sun Valley Animal Center a call to schedule with our team.